HC PHOTONICS CORP社　PPLN mixers/Waveguide mixer | HCP/HC PHOTONICS CORP社 | レーザー機器　専門商社｜株式会社アルクゥズ　ALQUZE Inc.
PPLN waveguide mixers are frequency conversion modules which integrate PPLN waveguide chips into a convenient, compact, robust, cost-effective packaged format for your application convenience. With waveguide structure, PPLN waveguide mixers have higher efficiency in single-pass configuration as compared to bulk mixers. 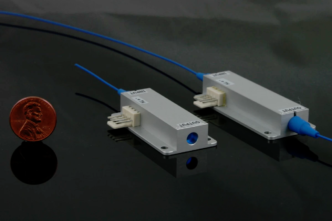 Optimized for your desired input pump lasers, PPLN waveguide mixers provide the polarization maintained output either in free space or optical fiber, with available output wavelength ranging from UV/Visible to NIR/MIR and output power up to sub-Watt or even up to Watt level. 1. 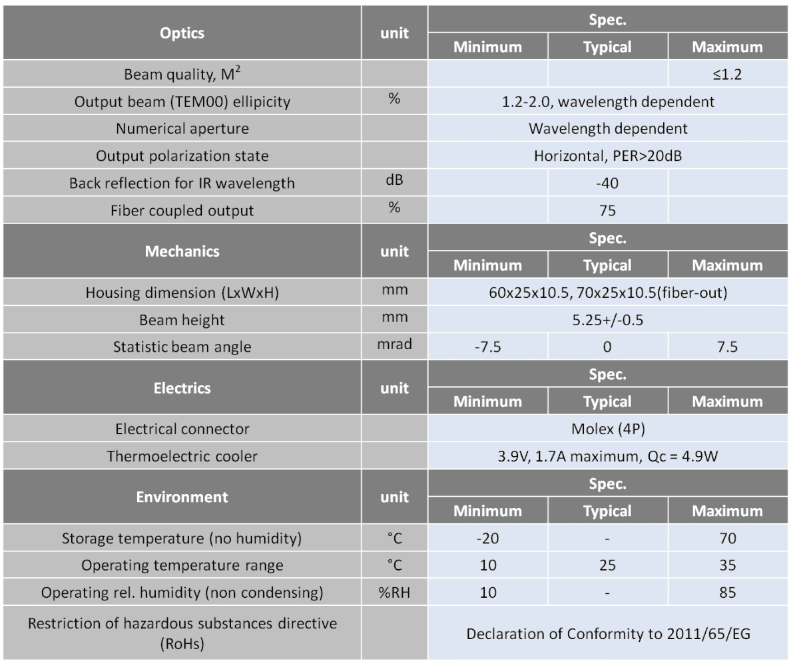 HC Photonics offers the best sellers at these wavelengths within +/- 0.5 nm. Custom wavelengths are available upon request. 2. SHG power is pump dependent. Please contact us for different power requirements with your pump conditions. 3. Typical coupling efficiency is 75% with single mode PM fiber. Please contact us for higher efficiency. 1. 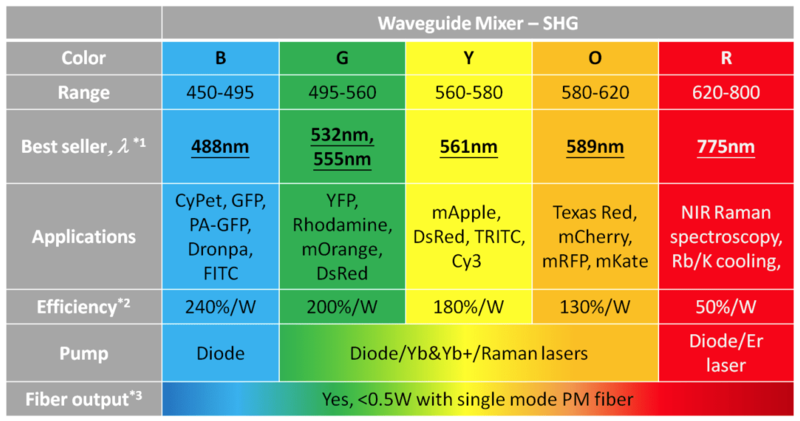 The wavelengths of the best sellers are within +/- 0.5 nm typically. Custom wavelengths are available upon request. 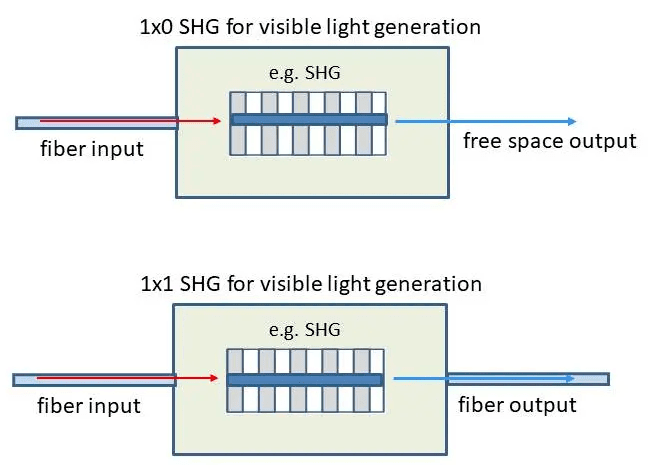 2.The SHG conversion efficiency is conservatively listed by pump condition with single-longitudinal mode lasers. Normally the efficiency could be doubled with multi-longitudinal mode lasers e.g. 180%/W @532 nm. 3. Typical coupling efficiency is >75%~ 80% with single mode PM fiber. Higher efficiency is available.